Was this sequel really necessary? Out of the pantheon of movie heavies -- Darth Vader, Freddy Kruger, Hannibal Lecter, Annie Wilkes -- one that probably never crossed my mind to see again was Gordon Gekko, the inside trader gone inside at the end of 1987’s Wall Street. Yes, there was a catchphrase that seemed to sum up the era of Reaganomics, “Greed is good”, but did that mean we needed to see him again? 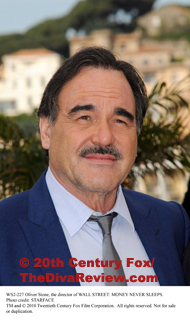 Apparently writer/director Oliver Stone thought so and crafted another morality tale around our avaricious moneyman. Considering the recent travails of the world’s economy, we are in a period very like the 1980’s, except possibly more dire. The money market playtime overseen by the previous administration has left wounds that the current regime can’t seem to heal, with unemployment and the rising of the poverty level at all time highs and oversized financial institutions glad handing for government bailouts -- bailouts that the average American can’t get a piece of. Perhaps the exploration of the sorry state of money today is what induced Stone to get Gekko out of the pokey and ready to take his place amongst society a chastened man. Yeah, right. Stone is so intent on providing a crash course on what exactly the George Bush bailouts hath wrought that the storyline for Wall Street: Money Never Sleeps seems itself a bit of a handout. A soap opera-y plot pegged to the points Mr. Stone would like us to observe with one of his most memorable characters -- himself a lesson in bad financial oversight -- thrown in as glue for the rickety premise. 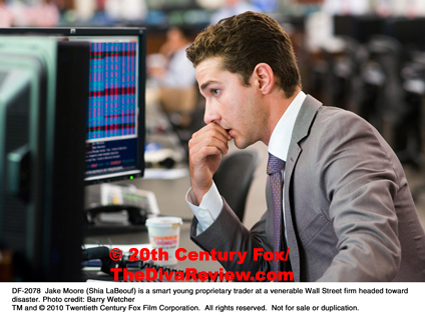 Another young Wall Street yuppie, Jake, a financial savant played by Shia LaBeouf, will fall under the sway of the recently-released Mr. Gekko. 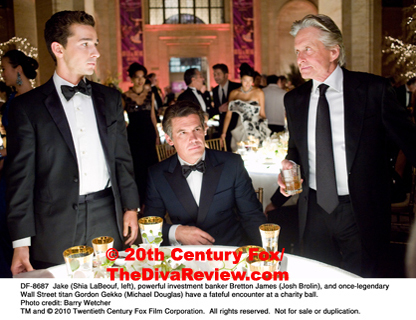 Jake is devastated when his mentor, the head of an investment house sees his decades of hard work undone by a rival’s whispering campaign. At the same time, Jake’s love life is looking up as he plans to pop the question to his girlfriend. 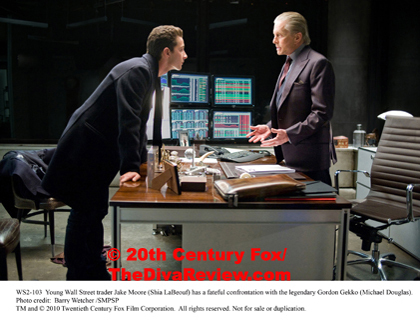 Having daddy issues of his own, Jake reaches out to his fiancée’s dad, one Gordon Gekko, in an effort to heal the rift that the older man’s time in the clink has caused. Of course, like The Jungle Book’s Mowgli looking into the eyes of Kaa the snake, Jake is hypnotized by both Gekko’s apparent devotion to his daughter as well as his seemingly prescient knowledge of the conditions which brought about the fall of Jake’s old job. After being warned by his girl not to get near her old man, Jake reasons they’re going to be in-laws, Gordon’s done time, he’s suffered, he’s learned his lessons, right? 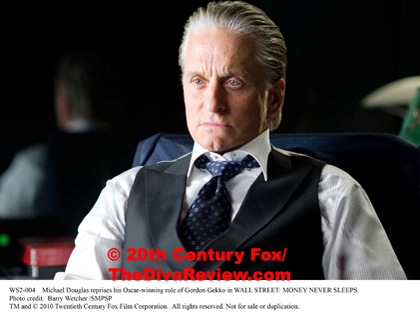 Besides Stone’s clear desire to parallel the voracious avarice of today’s financial climate to those of his original 1987 opus, Wall Street: Money Never Sleeps really has no reason to be other than its star Michael Douglas. 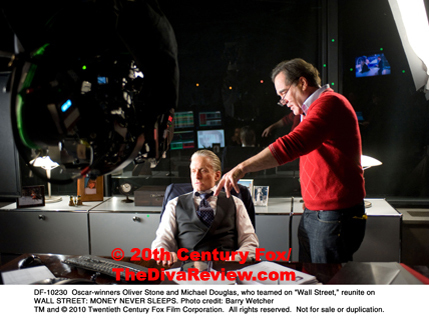 Douglas was recently diagnosed with throat cancer, which brings a strange voyeurism to the proceedings: Knowing that Gekko’s haggardness is due to more than just the character’s time inside and his references to the unstoppable pillaging of America’s financial future as a cancer make one cringe in their seat, as do the discussions of the character’s son’s drug problem, an issue currently being faced in the actor’s household. Still, Douglas, whose film appearances have become increasingly rare throws himself into Gekko’s skin full stop, playing the ultimate insider with a gusto we’ve not seen from him in many years. While clearly the star of the show (Sorry, I still don’t understand why directors love Shia LaBeouf so much. His nebbishy everyman isn’t bad, but is nothing particularly special either, and I’ve no idea how old the actor is but he still looks like he’s just out of high school. ), Douglas chews his scenery with lovely table manners; deigning not to completely obliterate the less skilled, less interesting LaBeouf off the screen in their shared scenes. The only other actor who holds their own compared to Douglas’ Gekko whirlwind is Frank Langella as Jake’s blustery mentor. Mr. Langella spares us by having a better dialogue coach than whoever approved unintentional comic relief Susan Sarandon’s Lon Gisland accent as Jake’s real estate pimping mom. The excellent and venerable Eli Wallach graces the film, making the most of a strange role where he mostly has to wave his fingers and whistle. Carey Mulligan is sweetly radiant and cries prettily (- as she does in Never Let Me Go) as Gekko’s leery daughter, but doesn’t have much to do outside of looking forlorn. Stone makes sure fans of the first film have enough cameos and references to keep them happy, but they also serve to enforce the inferiority of this sequel. 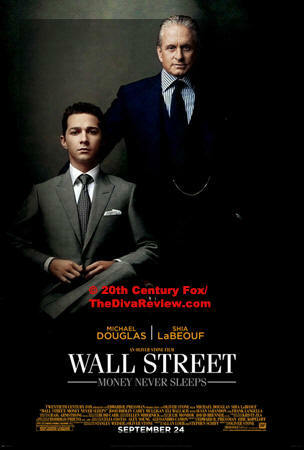 Wall Street: Money Never Sleeps is more of the same tale of financial malfeasance strung together with a soap opera storyline. Good thing for Stone that Michael Douglas slips so easily into his hair gel and Armani suit as Gordon Gekko and manages to make the warmed-over slosh bearably entertaining.